Pictured are Bruce Steelman, University of Tennessee Extension Agent, Davy Sneed CCCA President, Shirley Dennis CCCA Treasurer, Phillip Fedun and Mike Whaley TDA Animal Crime Unit. 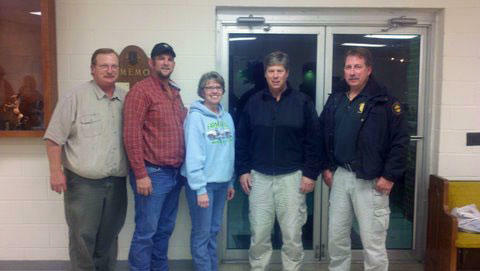 Members of the Tennessee Department of Agriculture’s Agricultural Crime Unit spoke at the Cannon County Cattlemen’s membership meeting held on Thursday, November 3 at the Woodbury Lions Club building. Criminal Investigators, Mike Whaley and Phillip Fedun, gave an overview of the wide range of investigations performed annually by his unit. Their area of expertise includes wildfire arson, livestock theft and farm crimes, and criminal activities on state forest lands. The Ag Crime Unit also enforces state laws, rules and regulations relating to the import of animals, animal diseases, use of state forests and other laws regulated by the Tennessee Department of Agriculture. In FY 2010, the AG Crime Unit investigated more than 530 cases. The majority of these cases were arson related. Wildfire arson is the most common crime the Ag Crime Unit investigates. Forest fires can spread quickly and endanger human life and property. TDA’s Ag Crime Unit is recognized statewide as being very knowledgeable on arson investigations. For more information on Tennessee Department Agriculture - Agricultural Crime Unit visit: www.tn.gov/agriculture/general/acu.htm. The event was sponsored by the Cannon County Cattlemen’s Association (CCCA). If you are interested in becoming a member of the Cannon County Cattlemen’s Association, contact Davy Sneed at the Woodbury Farmers Coop, Shirley Dennis at the Cannon County Farm Bureau or Bruce Steelman at the Cannon County Extension Office. The annual cost for being a member of the CCCA is $10. For more information, contact the Cannon County Extension Office at 615-563-2554.